Animation showing geosynchronous satellite orbiting the Earth. A geosynchronous orbit (sometimes abbreviated GSO) is an orbit around Earth of a satellite with an orbital period that matches Earth's rotation on its axis, which takes one sidereal day (about 23 hours, 56 minutes, and 4 seconds). The synchronization of rotation and orbital period means that, for an observer on Earth's surface, an object in geosynchronous orbit returns to exactly the same position in the sky after a period of one sidereal day. Over the course of a day, the object's position in the sky traces out a path, typically in a figure-8 form, whose precise characteristics depend on the orbit's inclination and eccentricity. Satellites are typically launched in an eastward direction. A circular geosynchronous orbit is 35,786 km (22,236 mi) above the Earth's surface. Those closer to Earth orbit faster than Earth rotates, so from Earth, they appear to move eastward while those that orbit beyond geosynchronous distances appear to move westward. A special case of geosynchronous orbit is the geostationary orbit, which is a circular geosynchronous orbit in Earth's equatorial plane (that is, directly above the Equator). A satellite in a geostationary orbit appears stationary, always at the same point in the sky, to observers on the surface. Popularly or loosely, the term geosynchronous may be used to mean geostationary. Specifically, geosynchronous Earth orbit (GEO) may be a synonym for geosynchronous equatorial orbit, or geostationary Earth orbit. Communications satellites are often given geostationary or close to geostationary orbits so that the satellite antennas that communicate with them do not have to move, but can be pointed permanently at the fixed location in the sky where the satellite appears. A semi-synchronous orbit has an orbital period of half a sidereal day (i.e., 11 hours and 58 minutes). Relative to Earth's surface, it has twice this period and hence appears to go around Earth once every day. Examples include the Molniya orbit and the orbits of the satellites in the Global Positioning System. where a is the semi-major axis, P is the orbital period, and μ is the geocentric gravitational constant, equal to 398,600.4418 km3/s2. In the special case of a geostationary orbit, the ground track of a satellite is a single point on the equator. In the general case of a geosynchronous orbit with a non-zero inclination or eccentricity, the ground track is a more or less distorted figure-eight, returning to the same places once per sidereal day. A geostationary satellite above a marked spot on the Equator. An observer on the marked spot sees the satellite remain directly overhead, unlike other celestial objects, which sweep across the sky. A geostationary equatorial orbit (GEO) is a circular geosynchronous orbit in the plane of the Earth's equator with a radius of approximately 42,164 km (26,199 mi) (measured from the center of the Earth). A satellite in such an orbit is at an altitude of approximately 35,786 km (22,236 mi) above mean sea level. It maintains the same position relative to the Earth's surface. If one could see a satellite in geostationary orbit, it would appear to hover at the same point in the sky, i.e., not exhibit diurnal motion, while the Sun, Moon, and stars would traverse the skies behind it. The theoretical basis for this novel phenomenon of the sky goes back to Newton's theory of motion and gravity. In that theory, the existence of a geostationary satellite is made possible because the Earth rotates (with respect to an inertial frame in which Newton's laws of motion and gravity hold). However, as a practical device, the geostationary satellite owes much for its realisation to Arthur C. Clarke who proposed it during the 20th century and in whose honour the orbit is called the Clarke orbit. Such orbits are useful for telecommunications satellites. A perfectly stable geostationary orbit is an ideal that can only be approximated. In practice the satellite drifts out of this orbit because of perturbations such as the solar wind, radiation pressure, variations in the Earth's gravitational field, and the gravitational effect of the Moon and Sun, and thrusters are used to maintain the orbit in a process known as station-keeping. Elliptical geosynchronous orbits are used in communications satellites to keep the satellite in view of its assigned ground stations and receivers. A satellite in an elliptical geosynchronous orbit appears to oscillate in the sky from the viewpoint of a ground station, tracing an analemma in the sky. Satellites in highly elliptical orbits must be tracked by steerable ground stations. The Infrared Space Observatory was in a highly elliptical geosynchronous orbit with an orbital height of apogee 70,600 km and perigee 1,000 km. It was controlled by two ground stations. NAVIC is a regional — i.e. non-global — Indian navigation system currently operating with 7 satellites, of which 3 are in geostationary orbit and 4 in geosynchronous orbit. The Quasi-Zenith Satellite System (QZSS) is a three-satellite regional time transfer system and enhancement for GPS, covering Japan at high elevation from a Tundra orbit. An active geosynchronous orbit is a hypothetical orbit that could be maintained if forces other than gravity were also used, such as a solar sail. Such a statite could be geosynchronous in an orbit different (higher, lower, more or less elliptical, or some other path) from the conic section orbit dictated by the laws of gravity. A further form of geosynchronous orbit is proposed for the theoretical space elevator, in which one end of the structure is tethered to the ground, maintaining a shorter orbital period than by gravity alone if under tension. Supersynchronous orbit: a disposal / storage orbit above GSO/GEO. Satellites drift in a westerly direction. Subsynchronous orbit: a drift orbit close to but below GSO/GEO. Used for satellites undergoing station changes in an eastern direction. Graveyard orbit: a supersynchronous orbit where spacecraft are intentionally placed at the ends of their operational lives. Synchronous orbits can only exist for bodies that have a fixed surface (e.g. moons, rocky planets). Without such a surface (e.g. gas giants, black holes) there is no fixed point an orbit can be said to synchronise with. No synchronous orbit exists if the body rotates so slowly that the orbit would be outside its Hill sphere, or so quickly that it would be inside the body. Large bodies held together by gravity cannot rotate that quickly, since they would fly apart, so the last condition only applies to small bodies held together by other forces, e.g. smaller asteroids. Most inner moons of planets have synchronous rotation, so their synchronous orbits are, in practice, limited to their leading and trailing (L4 and L5) Lagrange points, as well as the L1 and L2 Lagrange points, assuming they do not fall within the body of the moon. Objects with chaotic rotations, such as exhibited by Hyperion, are also problematic, as their synchronous orbits change unpredictably. Author Arthur C. Clarke is credited with proposing the notion of using a geostationary orbit for communications satellites. The orbit is also known as the Clarke Orbit. Together, the collection of artificial satellites in these orbits is known as the Clarke Belt. 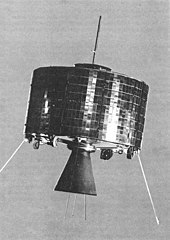 The first communications satellite placed in a geosynchronous orbit was Syncom 2, launched in 1963. However, it was in an inclined orbit, still requiring the use of moving antennas. The first communications satellite placed in a geostationary orbit was Syncom 3. Geostationary orbits have been in common use ever since, in particular for satellite television. Geostationary satellites also carry international telephone traffic but they are being replaced by fiber optic cables in heavily populated areas and along the coasts of less developed regions, because of the greater bandwidth available and lower latency, due to the inherent disconcerting delay in communicating via a satellite in such a high orbit. It takes electromagnetic waves about a quarter of a second to travel from one end to the other end of the link. Thus, two parties talking via satellite are subject to about a half second delay in a round-trip message/response sequence. Although many populated land locations on the planet now have terrestrial communications facilities (microwave, fiber-optic), even undersea, with more than sufficient capacity, telephone and Internet access is still available only via satellite in many places in Africa, Latin America, and Asia, as well as isolated locations that have no terrestrial facilities, such as Canada's Arctic islands, Antarctica, the far reaches of Alaska and Greenland, and ships at sea. ^ V. Chobotov, ed., (1996) Orbital Mechanics, 2nd edition, AIAA Education Series, p. 304. ^ "Ariane 5 User's Manual Issue 5 Revision 1" (PDF). arianespace. July 2011. Archived from the original (PDF) on 4 October 2013. Retrieved 28 July 2013. ^ "What is orbit?". NASA. October 25, 2001. Retrieved 2013-03-10. Satellites that seem to be attached to some location on Earth are in Geosynchronous Earth Orbit (GEO)...Satellites headed for GEO first go to an elliptical orbit with an apogee about 23,000 miles. Firing the rocket engines at apogee then makes the orbit round. Geosynchronous orbits are also called geostationary. ^ Vallado, David A. (2007). Fundamentals of Astrodynamics and Applications. Hawthorne, CA: Microcosm Press. p. 31.